President Donald Trump on Friday ordered the FBI to conduct a supplemental investigation into the sexual misconduct allegations against Supreme Court nominee Brett Kavanaugh, stipulating that the probe must be limited and completed within one week. "I've ordered the FBI to conduct a supplemental investigation to update Judge Kavanaugh's file," Trump said in a statement, according to White House press secretary Sarah Huckabee Sanders. "As the Senate has requested, this update must be limited in scope and completed in less than one week." "I’ve ordered the FBI to conduct a supplemental investigation to update Judge Kavanaugh’s file. As the Senate has requested, this update must be limited in scope and completed in less than one week." Trump's order came hours after Sen. Jeff Flake (R., Ariz.), one of the key swing votes in Kavanaugh's confirmation process, requested to delay a Senate confirmation vote on the Supreme Court nominee to allow an FBI investigation to take place. "This country is being ripped apart here," Flake said at a meeting of the Senate Judiciary Committee. "I do think we can have a short pause and have the FBI investigate … It would be short and limited in scope to the current allegations here." Flake agreed to send Kavanaugh's nomination to the full Senate, but said he would not support a floor vote for the nominee without the FBI probe. Senators from both parties agreed to ask for the bureau to investigate, leading Trump to order the probe. The judiciary committee voted along party lines 11-10 to send Kavanaugh's nomination to the Senate floor for a chamber-wide vote. Earlier on Friday, Trump said that he would rely on the Senate to determine how to proceed with the confirmation of Kavanaugh. "I'm going to let the Senate handle that. They'll make their decisions and they've been doing a good job. Very professional," Trump said. "I will be totally reliant on what Senator [Chuck] Grassley [R., Iowa] and the group decides to do." Dr. Christine Blasey Ford has accused Kavanaugh of pinning her to a bed, groping her, and trying to take off her clothes before she escaped at a high school party in the early 1980s. Kavanaugh has adamantly denied the allegation. 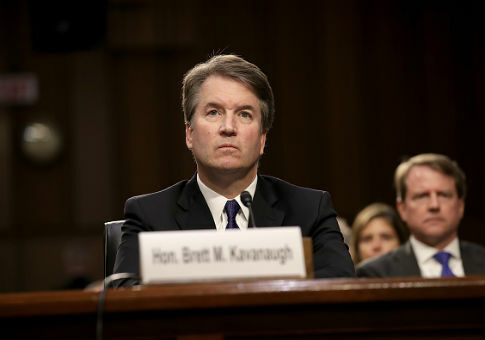 Both Ford and Kavanaugh testified before the judiciary committee on Thursday, each doubling down on their position. After the hearing, Trump tweeted out his support for Kavanaugh and called for the Senate to vote on his nomination. "Judge Kavanaugh showed America exactly why I nominated him," Trump wrote. "His testimony was powerful, honest, and riveting. Democrats' search and destroy strategy is disgraceful and this process has been a total sham and effort to delay, obstruct, and resist. The Senate must vote!" When asked Friday if he has considered another name to replace Kavanaugh as the nominee, Trump told reporters, "Not even a little bit." Two other women have also accused Kavanaugh of sexual misconduct when he was in high school and college. Kavanaugh has denied those allegations as well. This entry was posted in Politics and tagged Brett Kavanaugh, Donald Trump, FBI, Supreme Court. Bookmark the permalink.